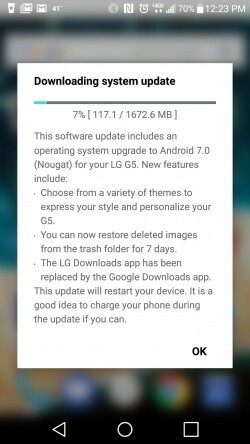 The update to Android 7.0 Nougat for the LG G5 keeps on spreading, with every day that goes by. 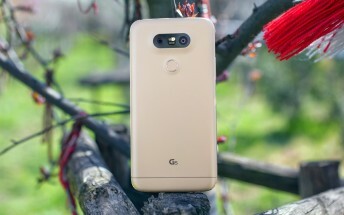 It's been launched in South Korea first, and recently we've seen it hitting G5 units sold by Sprint, T-Mobile, as well as US Cellular. And now it's finally time for this new software to make it to Verizon's LG G5. The rollout has seemingly commenced today, according to multiple people who have received the update. It's a 1.6GB download, so make sure you get it via Wi-Fi. As you can see from the screenshot to the left, the mini changelog LG has outed for this build contains information about such features as new themes, a replacement of LG's Downloads app by Google's, and the newfound ability to restore deleted images from the Trash folder for seven days. Of course these aren't all the new things you'll see once you update. The release also packs the features that Google built into Android 7.0 and which have survived LG's modifications intact. Hopefully at least the new notification design (complete with direct reply functionality) has been kept by the Korean company unaltered. As usual with such rollouts, it may take a few days before you get an update notification, so don't despair if you don't see it yet.